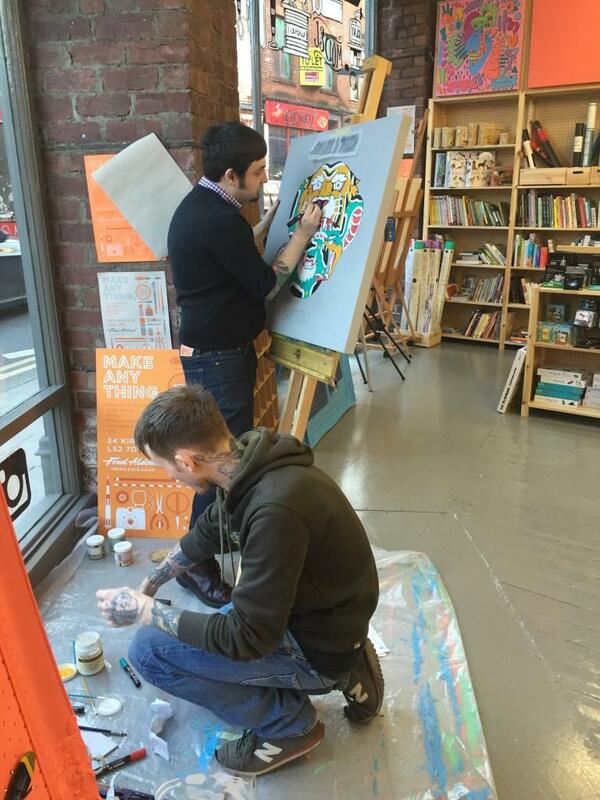 Earlier this year, I was invited, along with my business partner at Snake & Tiger Tattoo, Gareth Miller to Fred Aldous to paint a canvas for them, live. Fred Aldous is an awesome, independent craft shop, that’s been going in Manchester since 1886. They opened their second store, in Leeds, just last year and since then have collaborated and built partnerships with lots of other local creative businesses. It’s a brilliant, quirky place that’s a one stop shop for students, artists, makers and crafters of all kinds to go and stock up on supplies. It really has absolutely everything you could possibly need! 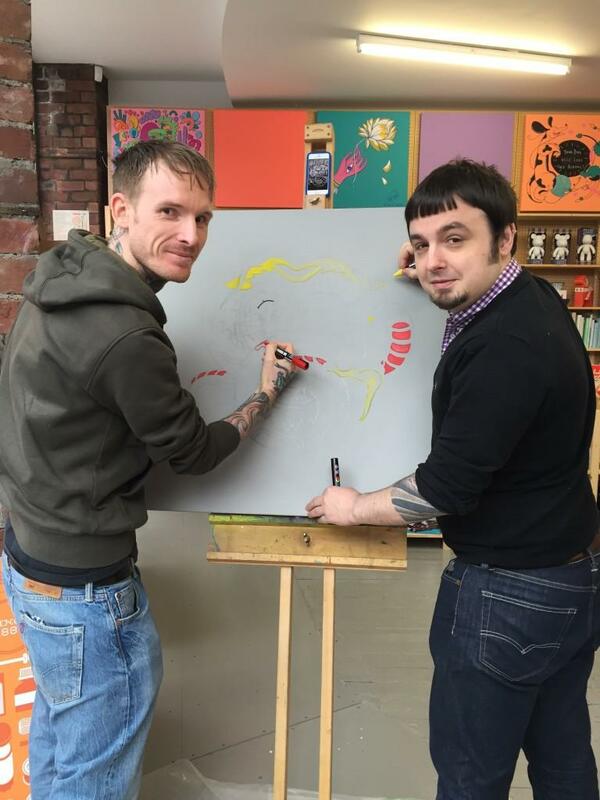 They got in touch a few months ago and asked Gareth and myself if we would go along and paint them a canvas, live. Obviously, we said yes. Here’s what we came up with! Tell us about what you have created for our canvas project? 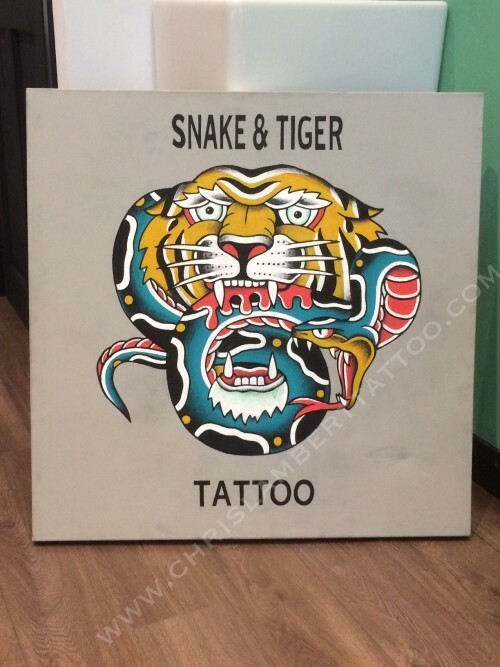 Our tattoo studio in Thornton’s arcade, Leeds is called Snake and Tiger Tattoo. We decided to paint an image based on the studio name. Our Number one influence is traditional tattooing style and one famous artist redound for this style is Cap Coleman. He was an American tattooist that worked between 1920 and 1960. He refined old school tattooing into what we know it as today, bold outlines, black under shading and solid colour. He was light years ahead of other tattooists at the time in terms of quality of designs and his technical abilities. He only worked using three colours, red, yellow and green, as those were the only tattoo pigments available at the time and in honour of this we chose this colour scheme for our canvas. Which materials did you use and why? We used poska pens and paint. Poska pens are faster than painting so we like the immediacy of them. Some of the lighter colours wouldn’t go over the grey background so we had to switch to paint. The shaded areas also had to be done with paint. If you’d like to find out some of our biggest creative influences, favourite tools and even the tattoo museum we’re creating for the shop, read the rest of the interview on the Fred Aldous blog.